The hazards of deal making in thegreat down turn were also crystallized. EnLink Midstream LLC paid $1.55 billion for subsidiaries of Tall Oak Midstream LLC in January. By February, the company’s total market capitalization fell to just $1.3 billion, attendees noted. In addition, NAPE Summit saw its share of anger at President Barack Obama. The Independent Petroleum Association of America came out swinging against the White House’s proposed $10 per barrel tax and the Clean Power Plan to curb CO2 emissions. Dan Naatz, IPAA’s senior vice president of government relations and political affairs, said the organization filed lawsuits to stay the administration’s hand on regulatory matters, including the Department of the Interior’s mandates on hydraulic fracturing on public and American Indian lands. With much to talk about, the turnout was good “considering the downturn we’re in,” said Trevor Hull, president of Challenger Exploration LLC, who has attended every NAPE since 2005 and whose company usually has a booth. “We’re starting to see a lot of conventional opportunities being shown that will work at this price point,” he said. “The Texas and Louisiana Gulf Coast is definitely going to see a bit of a revival, and that is good for the smaller operators — they had a hard time competing with all the shale plays.” Phil Martin of New Century Exploration LLC said he has gone from selling prospects at NAPE to making acquisitions this time around. “This is such a good melting pot to talk to so many people,” he noted. With the challenge of low oil prices, some attendees said the industry is in hibernation now, while others described it as a period of incubation and waiting for better times. “We can sit tight until oil gets back to $35, but I hope it doesn’t stop there — although with the drop in service costs, it’s almost like conventional plays are more economic than unconventional ones,” Martin said. 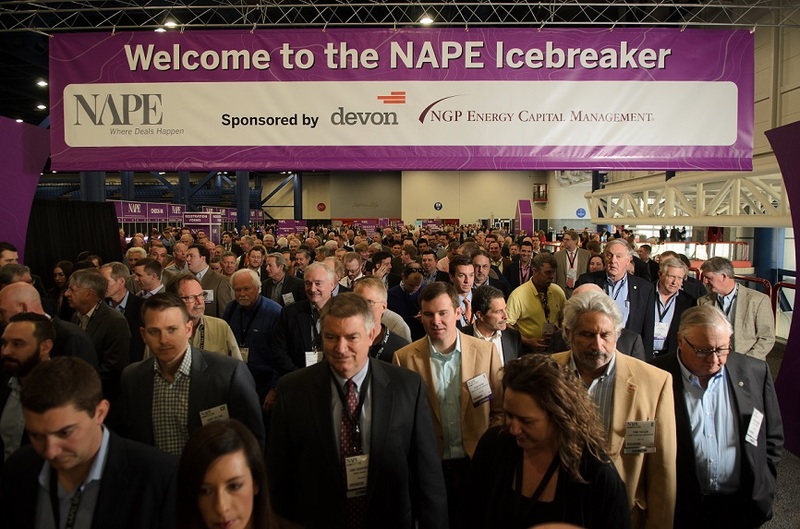 NAPE continues to attract people from every facet of the industry, from legendary oilmen like Herbert Hunt of Petro-Hunt LLC to entrepreneurs in their late 20s who are starting to invest in oil and gas with the goal of building an E&P company. This year’s NAPE Summit also drew producerslarge and small from across the country and globe to the show floor. Despite the downturn, companies were ready to make deals happen and packed the exhibit hall with more than 11,300 attendees and 700 exhibit booths. New for 2016, the international booths representing opportunities in countries as diverse as Ireland and Australia were located on the main show floor rather than in separate adjacent aisles, as in the past. This greatly increased their traffic and opportunities to talk with business prospects. Another big success, for the first time, in NAPE’s 20-year history the Prospect Presentations included a full day of domestic and international presentations running concurrently in two separate theaters. To a packed room of potential buyers, 46 domestic and international companies showcased active prospects. Each year, NAPE gives back in the form of its NAPE Charities Luncheon, which this year featured former New York Mayor Rudy Giuliani, who addressed leadership traits in the industry, especially for executives dealing with a challenging environment. He also criticized federal policies that are impeding oil and gas development in America at a time of low oil and gas prices. “We should all be planning, when the market is going up, for the day when it will go down,” Giuliani said. “And when it goes down, you have to know it’s not going to stay down. … Don’t be afraid of the storm; this is what life’s about. It’s about ups and downs, and it’s the leaders who can get us through.” The NAPE Charities Luncheon continued its longtime tradition of supporting veterans’ charities, bestowing $75,000 each to Canine Companions for Independence, Operation Finally Home and Rebuilding America’s Warriors — for a total of $225,000.